How did Alan Mulally--an outsider to the auto industry--lead such a spectacular turnaround at Ford? How did Morgan Stanley CEO John Mack keep his company from imploding even as Lehman Brothers collapsed? What is it that enables such extraordinary leaders to galvanize their talents and energy, as well as the talents and energy of those who work for them, to achieve superior performance no matter what challenges they face? In this lively and remarkably empowering book, Peshawaria offers readers the opportunity to experience the highest level of leadership training available in the world. Introducing the three core principles he has observed are the foundation of the best leadership--that great leaders clearly define their purpose and values; that nobody can motivate another person because everyone comes premotivated; and that a leader's job is not to directly produce results but to create the conditions that will harness the energy of others--he details his unique and proven program for achieving leadership excellence. Sharing a wealth of illuminating stories, from those of Mulally's achievement at Ford and Mack's at Morgan Stanley, to how Harvey Golub and Ken Chenault successfully restored American Express to long-term sustainable growth, how Neville Isdell turned the Coca-Cola Company around, and the continuing prowess of Jeff Bezos in growing Amazon.com, he first reveals how extraordinary leaders marshal and sustain the level of energy in themselves that is required and how they enlist a core group of proficient co-leaders. He then outlines how to harness the energy and talents of those at all levels of an organization, igniting their motivation by following his RED guidelines for addressing their core needs concerning their Role, their work Environment, and their career Development. Finally, he introduces his unique Brains, Bones, and Nerves framework for: developing a clear strategy for competitive advantage (the Brains); crafting an optimal organizational structure (the Bones); and fostering a highly cooperative and motivated company culture (the Nerves). Filled with specific tips about the vital questions to ask and simple but powerful steps to follow, Too Many Bosses, Too Few Leaders is a manager's essential tool kit for long-term superior performance. -Steve Kerr, the former Chief Learning Officer and a Managing Director of Goldman Sachs and author ofReward Systems: Does Yours Measure Up? 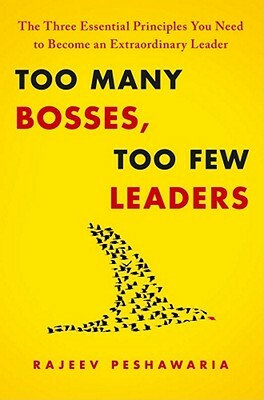 "The fascinating aspect of Too Many Bosses, Too Few Leaders is that it is much less a 'how to' and much more a 'why' exploration of leadership, going deeply into the subject in a manner I have not seen before. Instead of preaching on the topic, as most of the other books do, he takes readers along a personal journey on a quest for leadership, uncovering the key elements of character, fortitude, processes and practices that will enable them to discover the leadership in themselves. This is a must read book because it is as much about kindling the intellect as it is about igniting the leadership passion in everyone." "Rajeev Peshawaria brings together a myriad of case studies and examples- from Toyota-GM to Mahatma Gandhi- to address an issue that will separate tomorrow's winning organizations from the losers." -Navin Agarwal, Executive Chairman, Vedanta Resources Plc. "Rajeev Peshawaria brings together a myriad of case studies and examples- from Toyota-GM to Mahatma Gandhi- to address an issue that will separate tomorrow's winning organizations from the losers. "—Navin Agarwal, Executive Chairman, Vedanta Resources Plc. "Very rarely is a leadership expert also a business leader himself, a teacher and consultant to the most admired corporations in the world, a brilliant thinker, and a great author. Mr. Peshawaria is one of those rare individuals. Anyone truly interested in the art, science, and psychology of leadership will be enriched by this very insightful and pragmatic book." "Peshawaria defines leadership with hands-on directives for managers andentrepreneurs...Accompaniedby charts and bulleted points, the author's clear-cut prose moves readersthrough the organizational structure...of asuccessful business model...Peshawaria’s examples and solid advice will help leaders lay the foundationfor company growth."